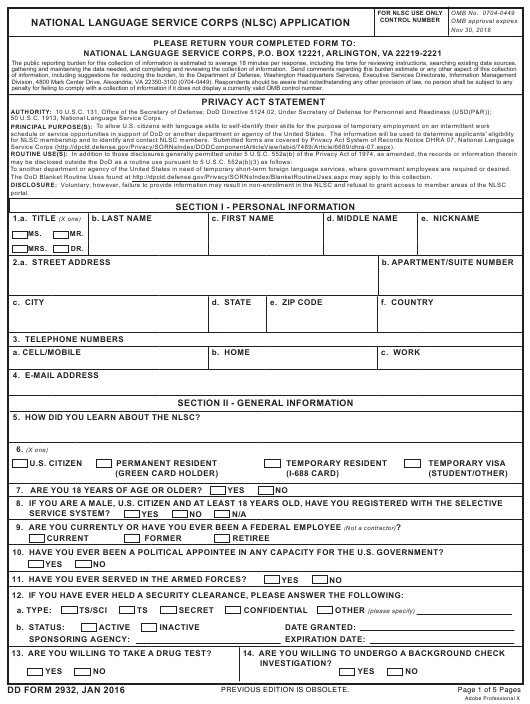 DD Form 2932 or the "National Language Service Corps (nlsc) Application" is a Department of Defense-issued form used by and within the United States Army. The form - often mistakenly referred to as the DA form 2932 - was last revised on January 1, 2016. Download an up-to-date fillable PDF version of the DD 2932 down below or find it on the Department of Defense documentation website. The DoD Blanket Routine Uses found at http://dpcld.defense.gov/Privacy/SORNsIndex/BlanketRoutineUses.aspx may apply to this collection. e . DID YOU GRADUATE? HOW WOULD YOU RATE YOUR SKILLS IN ENGLISH? b. WHERE DID YOU LEARN ENGLISH? c. HOW OFTEN DO YOU USE ENGLISH? d. HAVE YOU TAKEN ANY CERTIFICATION TESTS OR FORMAL TESTS IN ENGLISH? HOW WOULD YOU RATE YOUR SKILLS IN THIS LANGUAGE? b. WHERE DID YOU LEARN THIS LANGUAGE? c. HOW OFTEN DO YOU USE THIS LANGUAGE? e. HAVE YOU TAKEN ANY CERTIFICATION TESTS OR FORMAL TESTS IN THIS LANGUAGE? grounds for not hiring me or for dismissal from the organization after I begin work and may be punishable by fine or imprisonment. I understand that any information I give may be investigated.